Have any of you watched 13 Reasons Why, the Netflix show that has gotten insanely popular since its release a few weeks ago? I read the book a long time ago (think 8th grade) and loved it, and was so excited there was going to be a TV show based on it! It sounds very strange to say that I love a show that talks about such serious subjects like suicide, but I think it's a great way to make people aware of what other people have going on in their lives. Anyway, if you haven't watched the show I highly recommend it! 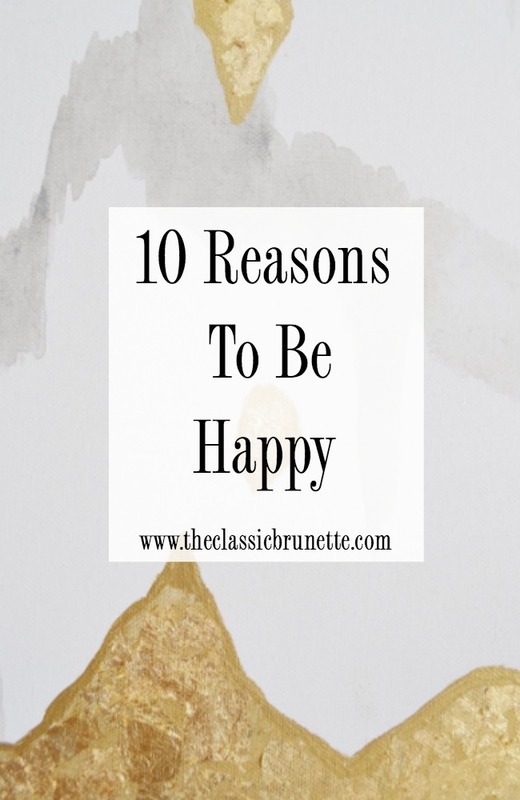 But I wanted to take a second and share on the blog that I know life can get you down sometimes, but there are also so many reasons to be happy! I'm sharing 10 things that always make me happy because sometimes we all need reminders to love life! What are a few things that make you happy? Leave them in the comments! Loved this post! It's always a good way to appreciate life by making a list of things that make you happy, something that always makes me happy is going to the park and just talking to a friend. Enjoying the sunshine, the kids playing. It's always so nice. Love this! Such a great list from an inspiring person! I love happy lists! I'm going to a family reunion this weekend and am so excited to spend time with everyone! I love number 10! I usually post twice per week, but only posted once per week these last two weeks. I am getting back into my routine this week, and it feels really good. I am so grateful to being doing something that I enjoy! Love this post Sami and I completely agree! My dog always makes me happy and puts a smile on my face! Such a great list! 13 Reasons Why was a great book and TV show! I couldn't stop watching. It's always good to recognize where we can be happy! I also like going to the movie theaters! Fresh flowers make me happy!! Waking around Target makes me happy! I still need to watch 13 reasons why! As weird as it sounds, there is definitely something weirdly satisfying about walking around Target like a woman on a mission. love this, I think it should be that I can afford a big house, it is really the most happy thing. Love this! I've watched 13 reasons 3 times (crazy I know...) and love the message! I feel like so many people have made fun of it... said it glamorized suicide... and more, but as someone who lost their mother to suicide... this depicts the truth. Someone suicidal often shows no symptoms that in the moment strike you as off or really out of character! So glad this show is out there to share the truth behind how hurtful words and actions can be! I recommend "A Girl Like Her" if you're into this type of content! So good!